Despite soaring adoption rates of smartphones and tablets across Asia Pacific, mobile applications remain a largely untapped opportunity within the travel industry here, according to a regional study released by Abacus International today. 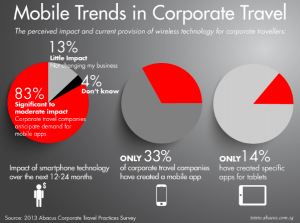 This is one of the primary findings of the ‘2013 Abacus Corporate Travel Practices Survey’ which collated the views of the most influential corporate travel companies and corporate travel agencies in Asia Pacific to uncover vital trends that are expected to impact their businesses over the next two to three years. Revealing a clear disconnect between the perceived importance and actual provision of smartphone and tablet applications in the industry, 83 per cent of respondents felt mobile technology would have a moderate to significant impact on their business, but only a third (33%) of those surveyed had implemented any mobile web or native applications as yet. Additionally, of those available only four in ten enable flight and hotel bookings via mobile and only one in ten provide the ability to make changes to existing arrangements. Just one in seven had created a specific app for tablet users. Corporate travel policy was another area where the prevailing trend was not reflected in the practice of agents. Despite the positive economic outlook acknowledged by all, 97 per cent had received instructions from clients to further tighten their policy terms. The pressure has led to increased demand for alternative flight and accommodation options, right into the long tail. More budget travel has clearly resulted. 73 per cent of respondents noted higher low-cost carrier (LCC) bookings for corporate travellers, mostly to comply with policies governing the choice of lowest fare. Robert Bailey, CEO of Abacus International notes, however, that the LCCs are also reaching out to the corporate sector much more. “While the low-cost market in Asia has yet to fully embrace corporate travel distribution, some budget carriers are now clearing a path to the corporate accounts, recognising the scale of the opportunity with trade partners, particularly on routes where low-cost competition is beginning to crowd out,” he said. Two patterns of corporate booking tool adoption were also seen to be emerging, which the study explores in more detail. Secondary expense management systems as a source of competitive differentiation were also identified, with over half looking to jump in on their popularity soon. The 2013 Abacus Corporate Travel Practices Survey was completed in April 2013 and is published today. For more information, contact marketing@abacus.com.sg.